GC-MS has been widely heralded as a "gold standard" for forensic substance identification because it is used to perform a 100% specific test, which positively identifies the presence of a particular substance. A nonspecific test merely indicates that any of several in a category of substances is present. Although a nonspecific test could statistically suggest the identity of the substance, this could lead to false positive identification. 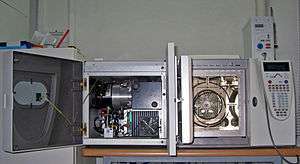 The use of a mass spectrometer as the detector in gas chromatography was developed during the 1950s after being originated by James and Martin in 1952. These comparatively sensitive devices were originally limited to laboratory settings. The development of affordable and miniaturized computers has helped in the simplification of the use of this instrument, as well as allowed great improvements in the amount of time it takes to analyze a sample. In 1964, Electronic Associates, Inc. (EAI), a leading U.S. supplier of analog computers, began development of a computer controlled quadrupole mass spectrometer under the direction of Robert E. Finnigan. By 1966 Finnigan and collaborator Mike Uthe's EAI division had sold over 500 quadrupole residual gas-analyzer instruments. In 1967, Finnigan left EAI to form the Finnigan Instrument Corporation along with Roger Sant, T. Z. Chou, Michael Story, and William Fies. In early 1968, they delivered the first prototype quadrupole GC/MS instruments to Stanford and Purdue University. When Finnigan Instrument Corporation was acquired by Thermo Instrument Systems (later Thermo Fisher Scientific) in 1990, it was considered "the world's leading manufacturer of mass spectrometers". In 1996 the top-of-the-line high-speed GC-MS units completed analysis of fire accelerants in less than 90 seconds, whereas first-generation GC-MS would have required at least 16 minutes. 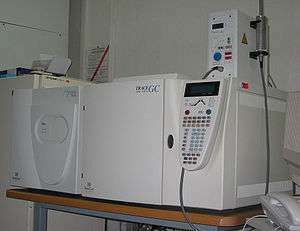 By the 2000s computerized GC/MS instruments using quadrupole technology had become both essential to chemical research and one of the foremost instruments used for organic analysis. Today computerized GC/MS instruments are widely used in environmental monitoring of water, air, and soil; in the regulation of agriculture and food safety; and in the discovery and production of medicine. For the analysis of volatile compounds, a purge and trap (P&T) concentrator system may be used to introduce samples. The target analytes are extracted and mixed with water and introduced into an airtight chamber. An inert gas such as Nitrogen (N2) is bubbled through the water; this is known as purging or sparging. The volatile compounds move into the headspace above the water and are drawn along a pressure gradient (caused by the introduction of the purge gas) out of the chamber. The volatile compounds are drawn along a heated line onto a 'trap'. The trap is a column of adsorbent material at ambient temperature that holds the compounds by returning them to the liquid phase. The trap is then heated and the sample compounds are introduced to the GC-MS column via a volatiles interface, which is a split inlet system. P&T GC-MS is particularly suited to volatile organic compounds (VOCs) and BTEX compounds (aromatic compounds associated with petroleum). After the molecules travel the length of the column, pass through the transfer line and enter into the mass spectrometer they are ionized by various methods with typically only one method being used at any given time. Once the sample is fragmented it will then be detected, usually by an electron multiplier diode, which essentially turns the ionized mass fragment into an electrical signal that is then detected. By far the most common and perhaps standard form of ionization is electron ionization (EI). The molecules enter into the MS (the source is a quadrupole or the ion trap itself in an ion trap MS) where they are bombarded with free electrons emitted from a filament, not unlike the filament one would find in a standard light bulb. The electrons bombard the molecules, causing the molecule to fragment in a characteristic and reproducible way. This "hard ionization" technique results in the creation of more fragments of low mass to charge ratio (m/z) and few, if any, molecules approaching the molecular mass unit. Hard ionization is considered by mass spectrometrists as the employ of molecular electron bombardment, whereas "soft ionization" is charge by molecular collision with an introduced gas. The molecular fragmentation pattern is dependent upon the electron energy applied to the system, typically 70 eV (electron Volts). The use of 70 eV facilitates comparison of generated spectra with library spectra using manufacturer-supplied software or software developed by the National Institute of Standards (NIST-USA). Spectral library searches employ matching algorithms such as Probability Based Matching and dot-product matching that are used with methods of analysis written by many method standardization agencies. Sources of libraries include NIST, Wiley, the AAFS, and instrument manufacturers. A mass spectrometer is typically utilized in one of two ways: full scan or selected ion monitoring (SIM). The typical GC-MS instrument is capable of performing both functions either individually or concomitantly, depending on the setup of the particular instrument. The primary goal of instrument analysis is to quantify an amount of substance. This is done by comparing the relative concentrations among the atomic masses in the generated spectrum. Two kinds of analysis are possible, comparative and original. Comparative analysis essentially compares the given spectrum to a spectrum library to see if its characteristics are present for some sample in the library. This is best performed by a computer because there are a myriad of visual distortions that can take place due to variations in scale. Computers can also simultaneously correlate more data (such as the retention times identified by GC), to more accurately relate certain data. Another method of analysis measures the peaks in relation to one another. In this method, the tallest peak is assigned 100% of the value, and the other peaks being assigned proportionate values. All values above 3% are assigned. The total mass of the unknown compound is normally indicated by the parent peak. The value of this parent peak can be used to fit with a chemical formula containing the various elements which are believed to be in the compound. The isotope pattern in the spectrum, which is unique for elements that have many isotopes, can also be used to identify the various elements present. Once a chemical formula has been matched to the spectrum, the molecular structure and bonding can be identified, and must be consistent with the characteristics recorded by GC-MS. Typically, this identification done automatically by programs which come with the instrument, given a list of the elements which could be present in the sample. In selected ion monitoring (SIM) certain ion fragments are entered into the instrument method and only those mass fragments are detected by the mass spectrometer. The advantages of SIM are that the detection limit is lower since the instrument is only looking at a small number of fragments (e.g. three fragments) during each scan. More scans can take place each second. Since only a few mass fragments of interest are being monitored, matrix interferences are typically lower. To additionally confirm the likelihood of a potentially positive result, it is relatively important to be sure that the ion ratios of the various mass fragments are comparable to a known reference standard. GC-MS is increasingly used for detection of illegal narcotics, and may eventually supplant drug-sniffing dogs. It is also commonly used in forensic toxicology to find drugs and/or poisons in biological specimens of suspects, victims, or the deceased. Several GC-MS have left earth. Two were brought to Mars by the Viking program. Venera 11 and 12 and Pioneer Venus analysed the atmosphere of Venus with GC-MS. The Huygens probe of the Cassini-Huygens mission landed one GC-MS on Saturn's largest moon, Titan. The material in the comet 67P/Churyumov-Gerasimenko will be analysed by the Rosetta mission with a chiral GC-MS in 2014. Dozens of congenital metabolic diseases also known as Inborn error of metabolism are now detectable by newborn screening tests, especially the testing using gas chromatography–mass spectrometry. GC-MS can determine compounds in urine even in minor concentration. These compounds are normally not present but appear in individuals suffering with metabolic disorders. This is increasingly becoming a common way to diagnose IEM for earlier diagnosis and institution of treatment eventually leading to a better outcome. It is now possible to test a newborn for over 100 genetic metabolic disorders by a urine test at birth based on GC-MS.
↑ James, A. T.; Martin, A. J. (1952). "Gas-liquid partition chromatography; the separation and micro-estimation of volatile fatty acids from formic acid to dodecanoic acid". The Biochemical Journal. 50 (5): 679–90. doi:10.1042/bj0500679. PMC 1197726 . PMID 14934673. 1 2 3 Brock, David C. (2011). "A Measure of Success". Chemical Heritage Magazine. 29 (1). Retrieved 22 April 2014. ↑ Brock, David C. (2008). "Detecting Success". Chemical Heritage Magazine. 26 (2): 31. ↑ "Thermo Instrument Systems Inc. History". International Directory of Company Histories (Volume 11 ed.). St. James Press. 1995. pp. 513–514. Retrieved 23 January 2015. ↑ JeromeJeyakumar, J.; et. al. (April 2013). "A Study of Phytochemical Constituents in Caralluma Umbellata By Gc – Ms Anaylsis [sic]" (PDF). International Journal of Pharmaceutical Science Invention: 37–41. Retrieved 23 January 2015. ↑ Wang, T.; Lenahan, R. (1984). "Determination of volatile halocarbons in water by purge-closed loop gas chromatography". Bulletin of Environmental Contamination and Toxicology. 32 (1): 429–438. doi:10.1007/BF01607519. ISSN 0007-4861. ↑ McLafferty, F. W.; Hertel, R. H.; Villwock, R. D. (1974). "Probability based matching of mass spectra. Rapid identification of specific compounds in mixtures". Organic Mass Spectrometry. 9 (7): 690–702. doi:10.1002/oms.1210090710. ↑ Stein, SE; Scott DR (1994). "Optimization and testing of mass spectral library search algorithms for compound identification". J Am Soc Mass Spectrom. 5 (9): 859–866. doi:10.1016/1044-0305(94)87009-8. PMID 24222034. 1 2 Amirav A, Gordin A, Poliak M, Fialkov AB (2008). "Gas chromatography-mass spectrometry with supersonic molecular beams". J Mass Spectrom. 43 (2): 141–63. doi:10.1002/jms.1380. PMID 18225851. ↑ Alon, T.; Amirav, A. (2006). "Isotope Abundance Analysis Method and Software for Improved Sample Identification with the Supersonic GC-MS". Rapid Communications in Mass Spectrometry. 20 (17): 2579–2588. doi:10.1002/rcm.2637. PMID 16897787. ↑ Tsivou, M.; Kioukia-Fougia, N.; Lyris, E.; Aggelis, Y.; Fragkaki, A.; Kiousi, X.; Simitsek, P.; Dimopoulou, H.; Leontiou, I. -P.; Stamou, M.; Spyridaki, M. -H.; Georgakopoulos, C. (2006). "An overview of the doping control analysis during the Olympic Games of 2004 in Athens, Greece". Analytica Chimica Acta. 555: 1–13. doi:10.1016/j.aca.2005.08.068. ↑ Smith, P. A.; Lepage, C. J.; Lukacs, M.; Martin, N.; Shufutinsky, A.; Savage, P. B. (2010). "Field-portable gas chromatography with transmission quadrupole and cylindrical ion trap mass spectrometric detection: Chromatographic retention index data and ion/molecule interactions for chemical warfare agent identification". International Journal of Mass Spectrometry. 295 (3): 113–118. doi:10.1016/j.ijms.2010.03.001. ↑ Sloan, K. M.; Mustacich, R. V.; Eckenrode, B. A. (2001). "Development and evaluation of a low thermal mass gas chromatograph for rapid forensic GC-MS analyses". Field Analytical Chemistry & Technology. 5 (6): 288–301. doi:10.1002/fact.10011. ↑ Patterson, G. E.; Guymon, A. J.; Riter, L. S.; Everly, M.; Griep-Raming, J.; Laughlin, B. C.; Ouyang, Z.; Cooks, R. G. (2002). "Miniature Cylindrical Ion Trap Mass Spectrometer". Analytical Chemistry. 74 (24): 6145–6153. doi:10.1021/ac020494d. PMID 12510732. ↑ Tekin, Kubilay; Karagöz, Selhan; Bektaş, Sema (2014-12-01). "A review of hydrothermal biomass processing". Renewable and Sustainable Energy Reviews. 40: 673–687. doi:10.1016/j.rser.2014.07.216. ↑ Krasnopolsky, V. A.; Parshev, V. A. (1981). "Chemical composition of the atmosphere of Venus". Nature. 292 (5824): 610–613. doi:10.1038/292610a0. ↑ Niemann, H. B.; Atreya, S. K.; Bauer, S. J.; Carignan, G. R.; Demick, J. E.; Frost, R. L.; Gautier, D.; Haberman, J. A.; Harpold, D. N.; Hunten, D. M.; Israel, G.; Lunine, J. I.; Kasprzak, W. T.; Owen, T. C.; Paulkovich, M.; Raulin, F.; Raaen, E.; Way, S. H. (2005). "The abundances of constituents of Titan's atmosphere from the GCMS instrument on the Huygens probe". Nature. 438 (7069): 779–784. doi:10.1038/nature04122. PMID 16319830. ↑ Goesmann, F.; Rosenbauer, H.; Roll, R.; Böhnhardt, H. (2005). "COSAC Onboard Rosetta: A Bioastronomy Experiment for the Short-Period Comet 67P/Churyumov-Gerasimenko". Astrobiology. 5 (5): 622–631. Bibcode:2005AsBio...5..622G. doi:10.1089/ast.2005.5.622. PMID 16225435. Robert P., Adams (2007). Identification of Essential Oil Components By Gas Chromatography/Mass Spectrometry. Allured Pub Corp. ISBN 1-932633-21-9. Adlard, E. R.; Handley, Alan J. (2001). Gas chromatographic techniques and applications. London: Sheffield Academic. ISBN 0-8493-0521-7. Eugene F. Barry; Grob, Robert Lee (2004). Modern practice of gas chromatography. New York: Wiley-Interscience. ISBN 0-471-22983-0. McEwen, Charles N.; Kitson, Fulton G.; Larsen, Barbara Seliger (1996). Gas chromatography and mass spectrometry: a practical guide. Boston: Academic Press. ISBN 0-12-483385-3. McMaster, Christopher; McMaster, Marvin C. (1998). GC/MS: a practical user's guide. New York: Wiley. ISBN 0-471-24826-6. Message, Gordon M. (1984). Practical aspects of gas chromatography/mass spectrometry. New York: Wiley. ISBN 0-471-06277-4. Niessen, W. M. A. (2001). Current practice of gas chromatography–mass spectrometry. New York, N.Y: Marcel Dekker. ISBN 0-8247-0473-8. Weber, Armin; Maurer, Hans W.; Pfleger, Karl (2007). Mass Spectral and GC Data of Drugs, Poisons, Pesticides, Pollutants and Their Metabolites. Weinheim: Wiley-VCH. ISBN 3-527-31538-1.